Panhandlers and the homeless in the City of Syracuse will have an alternative to asking for money on the streets come May. 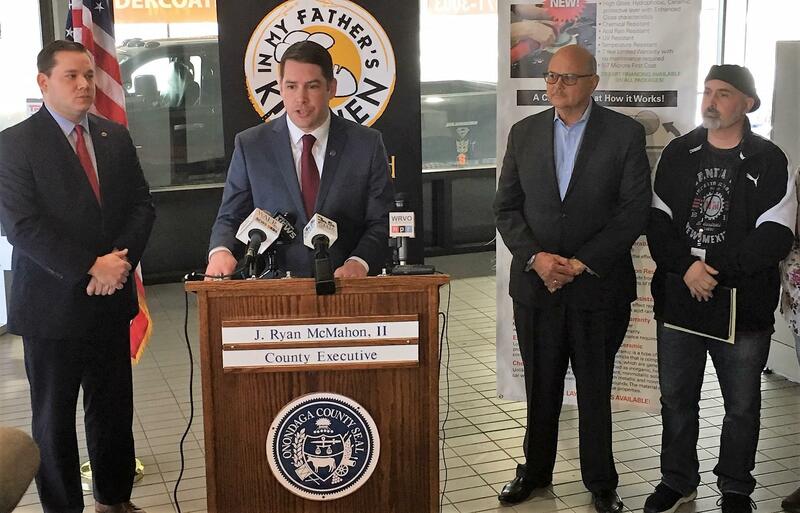 In My Father’s Kitchen was awarded a $180,000 county grant to help fund a day labor pilot program aimed at giving panhandlers the opportunity to work. A new City-County collaboration is aiming to help panhandlers in Syracuse enter the workforce. Mayor Ben Walsh says John and Leigh-Ann Tumino are a valuable part of the Syracuse community. "It's about getting people the resources and the support they need, and as the county executive said, providing people with opportunities to work provides them with dignity. That's such an important part of helping people heal and get through the difficulties they're facing in their lives." "Hire Ground" as the program is called will pick up as many as nine people a day and drop them off at pre-determined jobsites around the city. Participants will earn $50 for five hours’ worth of work. A meal and two breaks will be included. Tumino knows the homeless community well, having delivered food to them for the last eight years. He also knows many of them have mental health and substance abuse problems. Tumino says Hire Ground seeks to give panhandlers opportunities and relationships they would not otherwise have. "These folks aren't even ready to be employable by an employer. But they are ready to work with us for a day, where we could show them, 'You did five hours today and you made $50. Imagine if you got clean, or if we hooked you up with your doctor, you started taking your medication, got you a place to stay, you could have full-time employment somewhere some day, and we can help you get there.'" 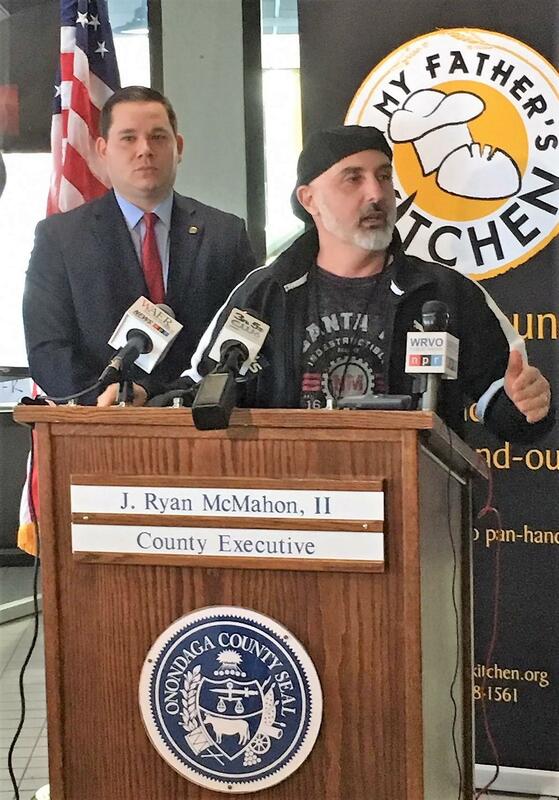 John Tumino of In My Father's Kitchen explains how they'll try to encourage panhandlers to join a new day labor program as County Executive Ryan McMahon looks on. Tumino says the van driver and a caseworker will work alongside program participants. He's aware there could be challenging moments. "Maybe you had a meltdown two hours into that shift, we could sit with you with a case manager, and ask 'What's going on right now?' If they have an addiction and are going through some kind of withdrawal, we could stop for them, and get them to a detox unit, get them to Helio Health, or to a doctor of they're having a mental health breakdown, on the moment, on the spot." Tumino will use the grant money and donations from outside investors to purchase a van and hire an additional full-time and part-time worker. He says they'll partner with existing agencies to assist the panhandlers. "You can't tell me that hope doesn't work, and that love doesn't work. Relationships change people's lives, and this program is going to help us go farther in building hope and changing lives." Hire Ground plans to start no later than May 1st.